As Chancellor, Dr. Burney will use his experience, contacts and wisdom to fulfill various duties, including the promotion of Lakehead University’s diverse local, national and global interests. In addition, Dr. Burney will have the authority to grant degrees at Convocation and represent the University at special occasions. “I am personally honoured to accept this appointment and look forward to representing Lakehead University as a beacon of academic excellence in my home town,” said Dr. Burney, an Officer of the Order Canada. The selection process for Chancellor of Lakehead University involved soliciting the public and University community for nominations. Candidate nominations were received and reviewed by a Chancellor’s Electoral Board, who recommended the appointment of Dr. Burney. 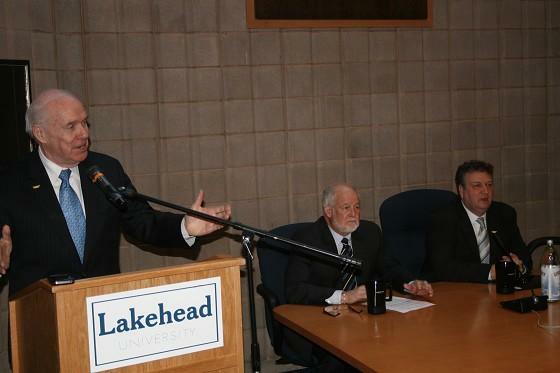 Dr. Burney succeeds Dr. Arthur Mauro, who served as Lakehead University Chancellor from 2009 to 2012. Click here to view Dr. Burney’s biography.